Sweet-spicy sriracha mingles with gochujang chile paste in this goes-with-everything hot sauce. Give any dish a welcome kick—from sandwiches and popcorn to Bloody Marys and Micheladas—with this hot take on a spicy sauce. 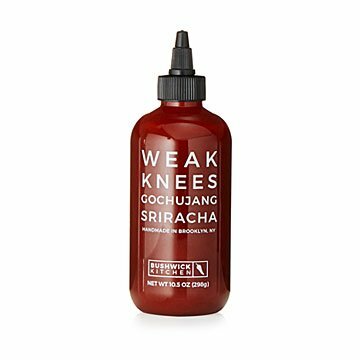 Sriracha, an addictive sweet-spicy medley of chilis, sugar, and vinegar, mingles with the fermented complexity of gochujang chile-soybean paste in this goes-with-everything condiment. With flavors that hail from Thailand and Korea respectively, this multi-cultural meeting of heat and sweet is as tasty swirled into recipes as it is on its own drizzled with abandon on just about any drink or dish. Handmade in small batches by Casey Elsass and Morgen Newman in Brooklyn, New York. Casey Elsass is a homemade gourmet and Morgen Newman is an entrepreneur. Togther, they found that the most interesting things come from mixing the unexpected, allowing life (and food) to be even more fascinating. They believe that food can taste extraordinary using only natures' finest ingredients. "I’m proud that our product is sourced from a family-run, chemical-free apiary. Our bees are treated right: only fed honey—never sugar water—and free to roam throughout the Hudson Valley’s landscape," says Casey. Join us on a studio tour tour of their workspace in Brooklyn. The sauce is interesting- though a bit tangy. It has more of a taste than regular sriracha and can change the taste of your food. This is a fun product that makes dishes of all kinds come alive. Fun, unique, boutique hot sauce. If you like the store bought Sriracha then this is gourmet sriracha. The best I've ever tasted. While this is definitely tasty, I found it to have almost no heat whatsoever. Maybe a 1.5 on a scale of 1-5. It is delicious on eggs, which is mostly what I use it for, but I have to supplement it with actual sriracha to get any heat. My mother, who can't handle anything even remotely hot, said this made her mouth slightly warm but not too much so. When this bottle is gone I may try another just to see if this was a one-off. This product was perfect. Not just spicy but flavorful too! Spicy and sweet...best of both worlds and chef inspired! I hope my family will like this gift. They like things spicy so I hope this will be to their liking. I'm not a big hot sauce person, but I do like gochujang. This is the best of both worlds. Big flavor, but not too hot. I can't wait to give my second bottle to my brother-in-law. Good stuff! This was a gift for my husband who loves Sriracha. He puts this stuff on everything.